The earliest evidence of a Military Science program at Grossmont High School is a small photograph in the 1948 yearbook “El Recuerdo.” The 1950 yearbook was the first to feature what we now know as the Military Science program — at the time called the California Cadet Corps. The program continued until 1971 when it ended, due to the controversy over the Vietnam War. Since 2009, Grossmont High School students — boys and girls — have an opportunity to be a part of NJROTC, the on-campus Junior Reserve Officer Training Corps. Today, there are 193 cadets enrolled in the classroom, which is the highest number of cadets ever at Grossmont. Cadets enroll in the program to develop leadership skills, discipline, as well as self-confidence. 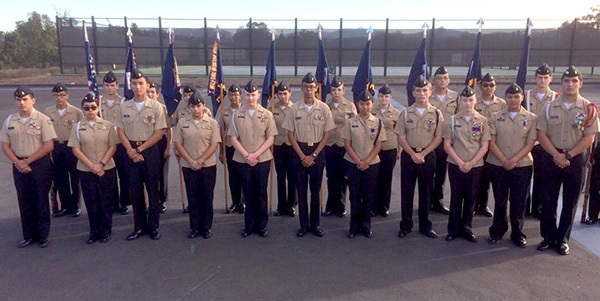 Because of the drastic growth in cadets (from 123 cadets last year), the NJROTC unit at Grossmont was able to advance from a company to a battalion. The cadets’ successful recruiting was recognized with a battalion establishment ceremony. Being a battalion opens up opportunities for leadership positions, which further encourage cadets to develop responsibility. The unit now consists of a Battalion Commander and two company commanders: the Alpha Company Commander and Bravo Company Commander. Over the summer, five outstanding cadets were selected to take part in the San Diego County NJROTC Leadership Academy, a week-long leadership training program for the most distinguished cadets in their units. Grossmont’s NJROTC unit sent five cadets to the San Diego Country NJROTC Leadership Academy, who were selected by their GPA, physical fitness, aptitude, and demonstration of the 11 leadership principles. At the beginning of the 2017-2018 school year, enrolled cadets were able to take part in a mini-bootcamp. Marine Corps drill instructors came to the school for a weekend and gave new cadets a jump-start on learning marching movements that are required within NJROTC’s curriculum. The cadets who participated in mini-bootcamp were divided into four platoons and instructed by four different drill instructors. At the end of the three days, the four platoons were graded on their ability to execute drill commands as a team. One platoon was chosen to be the best of the competing platoons based on their performance and was awarded the Honor Platoon ribbon. 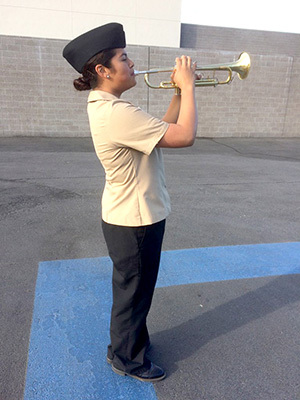 Throughout the year, cadets can join different teams in the Grossmont NJROTC unit. Some of these teams include drill, or marching, teams: the Unarmed Basic Drill Team, in which cadets demonstrate their ability to execute drill commands; the Unarmed Exhibition Drill Team, in which cadets perform a marching routine that consists of drill movements and rhythmic beats; and lastly the Armed Drill Team, in which cadets execute drill movements with rifles. Other teams include the Sea Perch Team, where cadets design, build, and operate small remotely piloted submersible vehicles; the Cyber Patriot Team, where cadets compete nationally by defending simulated business networks from cyberattack; the P.T. (Physical Training) Team, where cadets test and improve their physical abilities; and the Marksmanship Team, a competitive air-rifle shooting team. Grossmont’s popular and competitive marksmanship program recently received a grant from the NRA Foundation, which allowed the school to offer stand up marksmanship as a varsity sport. As a result, Foothillers will have the opportunity to participate in marksmanship at the freshman, junior varsity, and varsity level. The program received four Anschutz 9015 precision air rifles as well as a clock/timer that will be used to host rifle matches for the first time. For more information about the NJROTC program, contact Brent Lapp at blapp@guhsd.net. To learn more about the GHS museum, visit online at foothillermuseum.com or visit the museum in person on Wednesday, Dec. 6 from noon–3:30 p.m. or by appointment. Contact 619-668-6140 or ghsmuseum@guhsd.net. — Cadets Chayla Crouch and Jocelyn Brown-Hill contributed to this report. Connie and Lynn Baer write on behalf of the GHS Museum.